The Crookes Forum is a voluntary community group of people who live or work in the Crookes area of Sheffield. Our aim is to bring together the local community to support and promote community activity and democratic engagement in our area. We have no paid staff. We have a committee of 4 volunteer Officers and local residents. We are quite flexible about encouraging anyone to get involved in whatever way they can. This encourages networking amongst existing groups and supports people who cannot attend meetings. We hold monthly meetings to take projects forward. 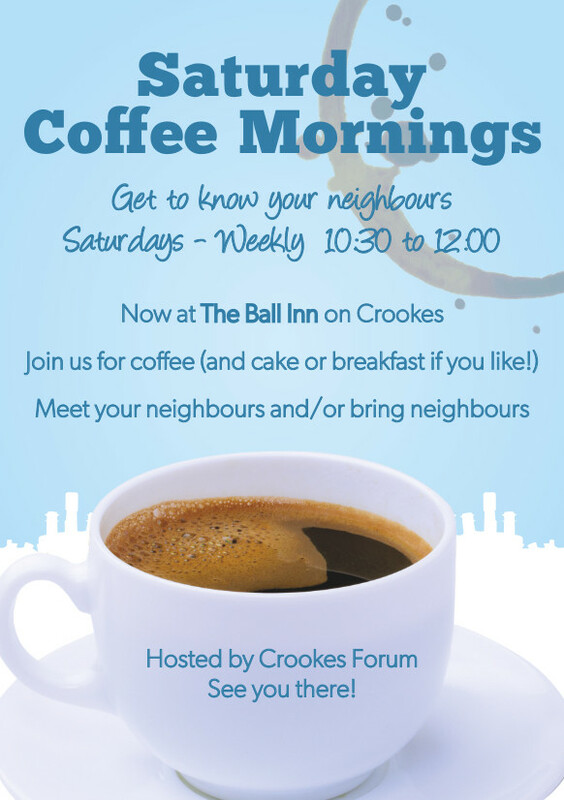 Our activities are open to anyone who associates themselves with Crookes. We will publicise local community activities, events and groups roughly in the Crookes, Crosspool, Walkley and Broomhill area but we won’t share commercial adverts. We will share Sheffield City Council consultations and information if it affects our local area. At the moment our regular meetings take place on the 2nd Weds of the month (excluding Aug, Dec & Jan) at Crookes Social Club. The meetings will be open meetings from 7.30 – 8.30pm for anyone to attend. The Ball Inn Crookes. 10.30am – 12noon. Everyone Welcome.